Certified Nurse-Midwife Melissa Merrill examines patient Jessica Burk on Monday at the St. Luke's Jerome Clinic in Jerome. Certified Nurse-Midwife Melissa Merrill listens to the heartbeat of Jessica Burk's baby Monday at the St. Luke's Jerome Clinic in Jerome. Certified Nurse-Midwife Melissa Merrill types a note in Jessica Burk's chart Monday at the St. Luke's Jerome Clinic in Jerome. 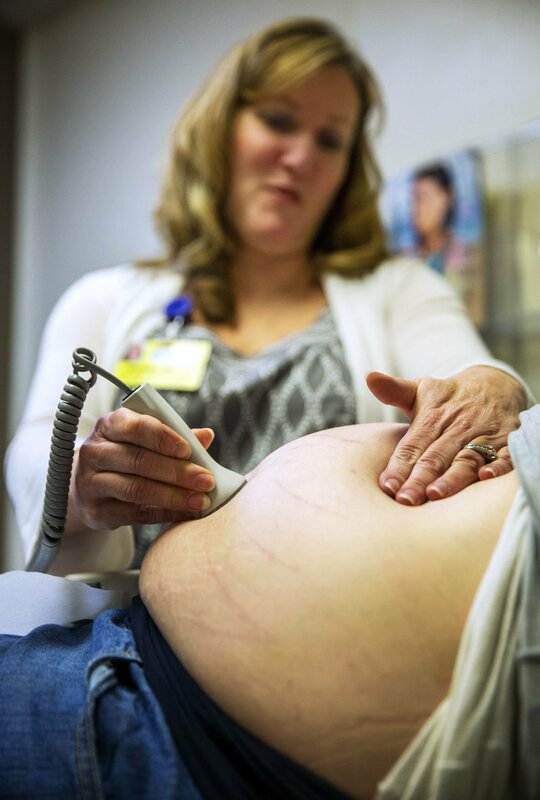 TWIN FALLS — LoriAnn Jones was interested in becoming a midwife after her own experience decades ago as an expectant mother. Jones — who now owns BirthLight Midwifery based in Buhl — gave birth to her last child 22 years ago using a midwife in Oregon. When Jones’ children started getting older and leaving home, she decided she wanted to “do something to help someone and of the deepest service,” she said. Jones — a certified professional midwife — is among just a handful of midwives in south-central Idaho. Receiving care from and having a baby delivered by a midwife remains rare here and across Idaho, but options are expanding. New Beginnings Birth Center — based in Meridian and staffed by midwives — has a post on its website saying it plans to offer home births and a birth center in Twin Falls this year. Company officials didn’t return an email or phone call from the Times-News. A total of 22,159 babies were delivered in Idaho in 2017, according to the Idaho Vital Statistics report released in November by the Idaho Department of Health and Welfare. Of those, the vast majority — 19,062 — were delivered by a physician rather than a midwife or someone else. And of the total number of deliveries, only 319 were delivered in a freestanding birthing center and 505 were homebirths. In Twin Falls County, two babies in 2017 were born in a “freestanding birthing center,” although it’s unclear which facility that is. As for home births, statistics show 10 happened in Twin Falls County, seven in Blaine County, three in Gooding County, three in Jerome County, two in Lincoln County and four in Minidoka County in 2017. So who’s a midwife? They’re a trained health professional who provides prenatal and postpartum care and delivers babies. Midwives in Idaho must be licensed by the state and by law can only take care of women who meet strict criteria, including those who don’t have any serious health conditions or prior pregnancy complications. In addition to the certified professional midwife license, a certified nurse-midwife is someone who has a master’s degree in nursing. Both must pass a national certification exam. The Idaho Midwifery Council has a list of midwives on its website, including a couple here in south-central Idaho: Jones and Mickey Habeck with Shoshone Family Medical Center. And there are others who aren’t included on that list. Jones provides care outside of a hospital setting. She aims to deliver two babies each month at her patients’ homes across the Magic Valley. Prenatal appointments are in Buhl. Jones has a small suite where she can deliver babies, too, but has only used it once. “Usually when people seek a midwife, they want to stay home to have their baby,” she said. Jones — who earned a state license in 2016 — said her small caseload allows her to spend a lot of time with families. She provides prenatal care from conception to birth and until six weeks postpartum. Jones graduated from the Midwives College of Utah and received certified professional midwife designation. “I’ve had a very fine education,” she said, adding it was similar to a four-year college and included clinical experience. Now, as a midwife here in the Magic Valley, how do her patients pay for care? One major challenge is most regular health insurance plans won’t cover home birth, Jones said, and she doesn’t bill Medicaid. Without insurance, the total fee is $3,500, according to Jones’ website, but that doesn’t include some expenses like ultrasounds or lab work through a physician or hospital. A $500 down payment is required and full payment for midwifery care is expected by 37 weeks gestation. Jones recommends health care sharing groups to her patients — such as through Samaritan Ministries — and provides patients with the necessary paperwork. “Those groups are really great with midwifery care,” she said. But midwifery isn’t for every family, Jones said, adding she thinks Idaho’s midwifery law is well crafted. Obstetricians are trained to deal with complications and problems pregnant women can have, Jones said. When she interviews a potential family seeking midwife care, she screens them very carefully to ensure the woman is healthy, she said, and the care is allowable under state law. But she does carry emergency equipment, has some limited medications — including anti-hemorrhagic medicine — and is trained in neonatal resuscitation. On a rare occasion when her patient is having difficulties, they’re transferred to St. Luke’s Magic Valley Medical Center. St. Luke’s Jerome Medical Center has a certified nurse-midwife: Melissa Merrill. St. Luke’s Magic Valley and Wood River medical centers don’t have any midwives. Merrill — who has been a midwife for 10 years — started in that role at St. Benedict’s Family Medical Center in Jerome. The hospital integrated with the St. Luke’s Health System in 2011. She averages 50 to 60 deliveries a year — about one-third of the total at St. Luke’s Jerome. She only does deliveries at the Jerome hospital. Merrill has a master’s degree in nurse-midwifery through the University of Cincinnati. It’s an advanced practice nursing degree similar to a nurse anesthetist or nurse practitioner, she said. She initially earned a bachelor’s degree in nursing and worked as a labor and delivery nurse for 10 years. During that time, she often met an expectant mother for the first time while the patient was in labor. In addition to an obstetrician coming in to deliver the baby, a pediatrician came in to see the baby following delivery. She said she felt there was a lot of “medicalization” to birth, such as a baby being warmed up before the mother got to hold him or her. But that has since changed even in the hospital setting, she said, and there’s a huge shift toward the initial bonding time and providing skin-to-skin contact. As a midwife, Merrill works out of the St. Luke’s Jerome family practice office. She sees patients for their prenatal visits, is with them during labor, delivery and postpartum checks. Her patients are considered low risk and don’t have any major health conditions. Merrill said the majority of her patients who seek her out want to build a one-on-one relationship prior to delivery. Some of her patients are second-time mothers who saw a multitude of different providers during their previous pregnancy, she said. Merrill works with her patients to develop a birth plan and get a sense of what they want. “It makes a little easier to facilitate that in labor,” she said. Some patients are looking for a natural birth experience, Merrill said, but it’s still in a hospital setting. And her patients don’t have to go completely natural. Some choose to get epidurals or pain medication. Mickey Habeck, a certified nurse-midwife for Shoshone Family Medical Center, has 20 years of experience as a midwife. She earned a master’s degree from the University of Utah. Before becoming a midwife, she was a nurse for St. Luke’s from 1988-96. Habeck said she was interested in becoming a midwife because she enjoys teaching and she can get to know all of her patients from prenatal care to postpartum. After Habeck became a midwife, she worked in Blackfoot and was the first midwife in southeast Idaho. “Now, there’s quite a few over there,” she said. Now, she has worked for 10 years at Shoshone Family Medical Center. Habeck is the primary provider there who delivers babies, but Dr. Keith Davis is her backup if she’s out of state. All of Habeck’s patients have her phone number, so if she’s visiting her mother in Boise, for example, she can be reached to come back to the Magic Valley to deliver a baby. Habeck provides prenatal care at the Shoshone clinic and delivers babies at St. Luke’s Jerome Medical Center. She said her patient load varies, but she’d love to deliver more babies. Patients come from not only Lincoln County but all over the Magic Valley. “There are a few families where I’ve done all their babies,” she said. Prenatal midwifery visits are usually longer than OB/GYN appointments, Habeck said, adding her appointments for routine prenatal care are generally 30 to 45 minutes long. Another difference: Habeck provides bedside labor support with her patients and is with them throughout the entire labor and delivery process. “I think to me, that’s the biggest difference between midwife care and a physician’s care,” she said, adding not all midwives are there for the entire labor. Mothers in labor at St. Luke’s who are receiving care from an OB/GYN often have their baby delivered by whoever is on call at the time — not necessarily by who they received their prenatal care with. TWIN FALLS — Magic Valley labor and delivery rooms were unusually quiet on New Year’s Day.